Lenovo has broken the seal on AMD’s entry-level Ryzen 3 2300X and Ryzen 5 2500X CPUs. The OEM has listed the budget-friendly AMD Ryzen chips within a platform specification document for its small form factor desktop PC: the ThinkCentre M725. 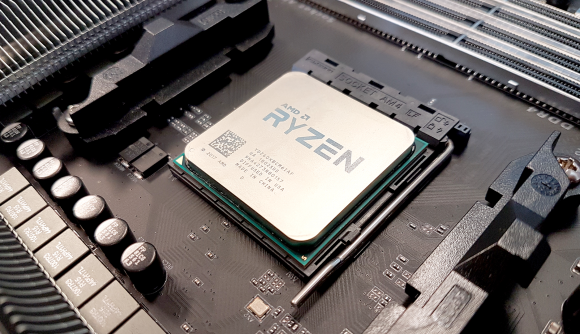 AMD replaced the bulk of its first generation Ryzen lineup with second generation CPUs in April, although the both the top and bottom of the product stacks were noticeably missing from the lineup – including the entry-level Ryzen 3 and Ryzen 5 chips and the Ryzen 7 2800X. The Ryzen 2400G and 2200G processors are the only second generation chips currently waving the budget banner – but not everyone is in need of an APU. Luckily, AMD has been working on similar 12nm refreshed chips for budget gamers: the Ryzen 5 2500X and Ryzen 3 2300X. The Ryzen 5 2500X will be a four-core / eight-thread chip, and will come with a base clock of 3.6GHz and boost up to 4GHz. That’s a 300MHz boost clock increase over the first gen Ryzen 5 1500X. According to the Lenovo document (Via Tom’s Hardware), the Ryzen 3 2300X will be a straight four-core chip, without simultaneous hyperthreading enabled, and will feature a base clock of 3.5GHz and also boost up to 4GHz. That’s an identical 300MHz improvement in boost clockspeed over the Ryzen 3 1300X. That’s also in line with what you might expect from the generational enhancements between AMD’s Ryzen and Ryzen 2 processors across the board. Alongside the improvements within the SenseMI suite, from the likes of Precision Boost 2 and XFR 2, this 300MHz boost across both CPUs should translate into a considerable boost for budget CPU gaming performance over the current entry-level chips and APUs. This isn’t the first time we’ve heard rumblings of the entry-level Ryzen chips, either. The above specs perfectly match those from a GeekBench entry spotted back in June, which also indicate a 65W TDP. So you can almost certainly expect these chips to launch with the same config. We also expect the Ryzen 5 2500X to come with a Wraith Spire cooler in the box and the Ryzen 3 2300X bundled with a Wraith Stealth – as was the case with their predecessors. AMD recently released its slightly toned-down B450 motherboards. This chipset has slightly limited functionality compared to the X470 motherboards launched alongside Ryzen 2 back in April, but, for the most part, makes for a fine replacement – especially for users trying to cut costs. We had expected AMD to launch the entry-level chips alongside the cheaper chipset, seeing as that was not destined to be, a close-by launch still seems quite likely.